I'm not sure what exactly this version of the RTP3 ought to be be called, since it isn't strictly either an RTP3C nor an RTP3D. The circuit I am working from, which was included with the Tube Preamp Cookbook in November 2005, has a few differences from the published RTP3C (dated 2000). However, it certainly isn't an RTP3D either, as I gather that the main differences between the two versions are in the external power supply, and the PSU in mine is unlikely to be the same as either of the commercial versions. To clarify, what I describe here consists of the phono stage module described as DPH1X88-1A and the line stage DLT5X88-5A, both circuits dated 2002. I am building these more or less faithfully, with only small changes (see below), and using component values as close as possible to those in Allen's schematics. My layout is based on the RTP3C shown in the photos here, which I gather belongs to Emile Sprenger. As far as possible, I am following the construction of Emile's RTP3, which I assume started off as a VSE kit and was built along Allen's guidelines. My RTP3 is housed in an approximately 3U full-width box, built up from 3mm sheet and 8mm square rod aluminium, with a 5mm thick front panel. There are removable aluminimum chassis plates, one for each of the phono and line stages for each channel, with all components mounted on these and hardwired to the valve sockets. My one deliberate deviation from the original is to use compliant mounting for the plates: instead of bolting these directly to the chassis, I inserted rubber grommets into the aluminimum sheet where the bolts would go, so the mounting is at least a little mechanically decoupled. This is the approach I used for my solid-state preamp and active crossover, and I feel it is especially desirable with a valve circuit, where microphonics are more likely. The top of the box is 3mm aluminium sheet, drilled with 8mm holes for ventilation, while I decided to do without a base (which would be a definite no-no for a commercial unit!). There is a rubber foot at each corner underneath, mounted to the chassis via triangular aluminium plates. There are four line inputs and one phono input for each channel, with both RCA phono (standard Maplin gold-plated, PTFE insulated) and balanced (Neutrik XLR) connectors. These are arranged similarly on the rear panel to the official RTP3, though I'm only using XLRs for the balanced signals, and not the optional Redel sockets. I have doubled up the tape output (RCA only) sockets to let me use a headphone amplifier as well as my cassette deck. The layout of the front panel controls is similar to that of the original, with a mute switch in the centre, flanked by the volume controls and then the source selectors at each end. I ended up having to swap the volume and source controls relative to the original arrangement, as I found that the switched attenuator vlume controls were too big to fit at the end of the line stage modules. The original RTP3 allows selection of either polarity of each source: in terms of circuit operation, this is very elegant, as it reduces two selections to a single switch per channel, though ergonomically it is a little clumsy and requires dual-gang twelve-way switches, which don't exactly grow on trees. To start with, I dispensed with the polarity switching, using a pair of Maplin's standard 6-way 2-pole rotary switches with silver-plated contacts for the source selection. After a couple of years, though, I replaced these I used ELMA 04-2124 two-pole 12-way switches for the input selector, which I bought from Foremost Electronics. These are beautifully made (certainly compared with the Maplin £2 plastic items! ), and are a pleasure to handle. Wiring these up simply involved connecting adjacent polarities of the respective source to adjacent contacts, and connecting the second wafer with hot and cold swapped over relative to the first. I can't say I am convinced that the effects of polarity are audible in my system, but I am pleased that I have made used of this feature of Allen's circuit, and the effect may turn out be more obvious with different speakers in the future. For a long time I resisted the idea of dual volume controls, having found them very frustrating on the Croft preamps I have used over the years. I don't normally need to use a balance control, so the main ergonomic advantage of dual controls is lost on me, and I found it very difficult to get a centre balance setting when I changed the volume. Using a power amplifier with quite high gain, all the practical volume settings lie within the first fifth or so of the rotation, and any tracking differences between the two pots are magnified. In the end I succumbed, however - partly because I wanted to get as close as possible to the physical layout of my RTP3 to the official version, and partly because I knew that with stepped attenuators (which I always planned to use with my RTP3) repeatable volume settings are far easier to find. To start with, the volume controls were Sfernice P11 dual 50K linear pots, which worked well in my solid-state preamp, though these have poor channel balance at low levels. To improve the volume resolution and channel balance at realistic levels, I padded down the 50K pots with parallel resistors to give an end-to-end resistance of 12.5K and inserted a series resistance of 33K to increase the attenuation by 12dB, while maintaining the input resistance at 50K. After a while, I decided to implement the volume control properly, with a parallel switched attenuator, which minimises the number of soldered contacts in the circuit but needs twice as many resistors and switch poles as the ladder attenuator used in the production RTP3D and many other high-end preamps. I decided to use twenty-four volume settings, which is probably marginal in terms of level resolution, but is the most practical compromise for a rotary volume control. The switch I settled on was the ELMA 04-4133 four-pole 24-way rotary switch with gold-plated contacts (the VSE RTP3D appears to use the two-pole version of the same model), which I sourced from Foremost Electronics, the UK ELMA distributor. I used 2dB steps at the lower end and 3dB at high level settings, with a maximum attenuation of -52dB. The resistors are the standard 0.6W metal film resistors from Maplin that I used elsewhere in the preamp: for most of the level settings I found I needed to use two E24 resistors in parallel to get within my target of 0.5% of the required value. The input resistance of the attenuator worked out to be 50K plus or minus about half a percent all the way across the range of attenuation. The much improved matching of the attentuation of the hot and cold signal polarities, relative to the Sfernice potentiometers, should improve the differential operation of the RTP3 by at least an order of magnitude. I couldn't put hand on heart and swear that I heard an improvement over the old Sfernice pots, but, with the logarithmic control and vastly improved channel matching, listening at low volumes becomes a realistic proposition, and it is much easier to find the right balance between channels at more normal listening levels. My selection of attenuation levels worked out to pretty much spot-on: the lowest (-52dB) is acceptably quiet for all sources, and I find I do most listening about halfway round the dial, which feels intuitively right. The front panel knobs are 38mm aluminium spun finish knobs from RS, while the mute switch is a DPDT long lever type from Farnell (stock code 918441), which seems to be a DPDT version of the type on Emile's RTP3 (though unconnected in his!). There isn't much information on the contents of the external power supply box in either the RTP3D brochure or in the TPCB itself, save for the strong recommendation to use choke regulation at least for the main B+ line. This involves inserting a large value (5-10H) choke between the rectifiers and the main reservoir capacitor, and has the significant advantage of smoothing the charging pulses through the transformer and rectifiers, although it does reduce the DC voltage available. I am using a couple of 10H, 150 ohm chokes for current regulation, which should drop a maximum of about 11V with a load of 70mA. The shunt regulators in the preamplifier need 330-350V DC at their inputs to give adequate headroom over their 300V output to the RTP. Beyond this, the PSU requirements are fairly straightforward, including +15V DC for the shunt regulator op-amp, -29V DC for the regulated bias supplies and three floating 12V DC supplies for the valve filaments. The power supply for my RTP3, comprising several handfuls of mains transformers and the recommended chokes, is in a separate box, as in the VSE original. 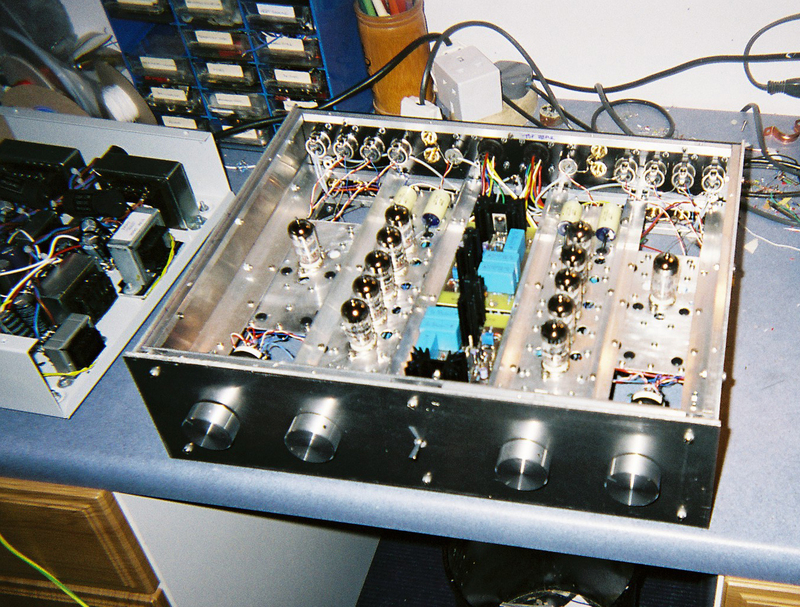 This is constructed and finished almost identically to the one containing the preamp itelf, but with a solid 3mm aluminimum base instead of the open bottom of the latter. Following my usual practice, the whole thing is dual-mono, with separate transformer windings for each channel. There are three transformers for the valve filament supplies, the two secondaries of each of these being split between channels. I used a 300V 180mA transformer from VVT for the main HT supply and a 10H 200mA choke. The latest RTP3D has polypropylene reservoir capacitors everywhere, but my box doesn't have room for these, except for the couple of microfarads right after the rectifiers and the 47uF 630V reservoirs after the chokes. I have also included a couple of 9V DC supplies for logic circuits, which I take from the spare 6.3V windings of the main HT transformers. One of these powers the mute relay, and the other could be regulated down to 5V TTL logic level if required. 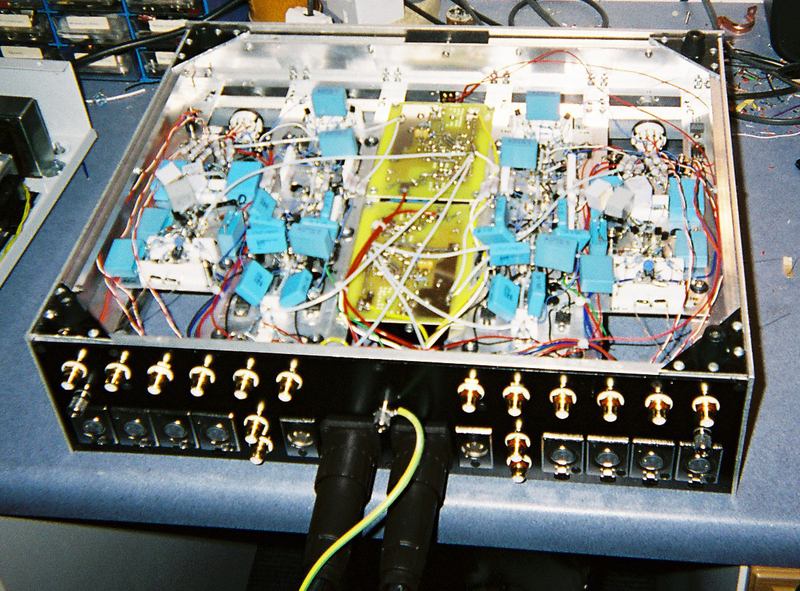 The PSU is connected to the preamp through a pair of 12-core umbilical cables, which mate with Amphenol 17-way connectors on the back panel of the latter. When I was making up the umbilicals, I forgot that the preamp box doesn't have its own chassis safety earth, which is definitely not optional in a circuit where over 350V DC is present. I added a couple of grounding posts, one on each box, which are connected with a single safety earth wire (visible in the photo below right). Eventually I will re-wire the power lead to include a safety earth. As I mention below, I had a problem with both shunt regulator circuits I used with my RTP3: after a while the regulated output voltage started to sag, eventually reaching a point where the phono circuit stopped functioning. After some consultation on DIYaudio I settled on the solution of replacing the two silicon rectifiers on the positive side of the bridge of each channel of the HT supply with an EH 6CA4/EZ81 valve rectifier. This takes ten or twenty seconds to reach its full conduction, so avoiding the switch-on overshoot with the solid-state rectifiers. I added a couple of B9A sockets and an extra transformer (2 x 6V@2A) for the 6CA4 filaments to the PSU box. I had to adjust the value of the capacitor before the choke from 1.5uF to 3uF to restore 350V at the input to the regulator. I'm not convinced yet that there won't be any overvoltage on switch-off, so I added a 375V varistor across the input of each regulator, just to be sure. Allen was very keen on the use of shunt, rather than the more usual series, voltage regulation of his audio circuits. These use an active device such as a MOSFET between regulated output and ground, controlled by a sensor circuit to maintain the output voltage at the required value, regardless of variations in input voltage and in the current draw by the subsequent circuit. There is also normally a constant current circuit at the input, which both minimises the influence of input noise and reduces power dissipation compared with the alternative, a power resistor. His reasons are discussed at length in the Tube Preamplifier Cookbook, and can be summarised as follows: the shunt regulator can sink as well as source current, where the series regulator can only supply current into the load. Allen argues that the shunt configuration is more capable of dealing with variations in (possibly reactive) load impedance and current draw. I am not completely won over by this, though. My feeling is that the main advantage of a shunt regulator is that the constant current circuit that normally precedes it gives two-way isolation between the regulator and the power supply: not only is the signal circuit then given extra isolation from any voltage spikes in the mains, but a constant current is also drawn from the power supply, so taking full advantage of choke filtering (Allen's other strong recommendation). I started off with Emile Sprenger's HPHV Regulator, which is a similar design to Allen's own SuperReg. This is a sophisticated and complex circuit with high performance, using a high-speed op-amp for wide bandwidth, and constant current sources everywhere to ensure stabe voltage for consistent operation. I downloaded the construction manual and PCB foils for the HPHV from Emile's website, but he has in the meantime taken them off there - I guess he hasn't the time to deal with all the enquiries from builders! If you would like a copy of the PDF construction manual for the HPHV, let me know and I will e-mail a copy to you. For several years my RTP3 seemed to be running quite happily with the HPHV supplying the 300V HT voltage to each channel, but I tracked a progressive dropout of the right-hand phono stage down to a drooping HT rail (gradually reducing after switch-on to 265V or so). I assumed at the time that there was an issue with my HPHV PCBs, and started looking for a simpler and potentially more reliable shunt regulator design. I found a project presented on the DIYAudio forum by Nikos Salas , the Salas Simplistic High-Voltage regulator (SSHV), which uses much simpler circuitry than the HPHV with no loop feedback. I decided to try replacing the HPHV boards with version 2 of this circuit, built on matrix board for ease of construction. I built this with a layout close to Nikos's PCB and it worked as a drop-in replacement for the HPHV. Even the SSHV2 is not immune to voltage spikes: I managed to kill all the semiconductors in one of the SSHV boards by pulling out the power connector while the PSU was still powered up. To stop this happening again, I added a couple of 160mA fuses in the HT line between the power connector and the regulator boards. Eventually,though, the SSHV regulators suffered the same fate as the HPHV: after a year or so the HT supply had dropped below 240V in the left channel, at which point the phono stage didn't work at all, and the other channel was also sagging conserably. At that stage I started to wonder whether the failure of both sets of regulator boards might be something to do with the power supply circuit itself, rather than with any design failings of either of the regulator circuits. A helpful contributor to the DIYaudio Tube Forum had earlier simulated my choke filter circuit with the Duncanamps PSUD package, which suggested (see post 216) a resonant overshoot to over 550V within the first second of power-up. This would be consistent with cumulative damage to both regulators after many daily switch-ons: both circuits are nominally specified to a maximum of 500V at their inputs, and this is the maximum voltage specification of the power MOSFETS used in these circuits. I replaced the obvious culprits in the SSHV regulator (the ones that are exposed to the full HT: in other words, the first DN2540 and the IRF830 shunt MOSFET) and replaced the two 1N4007 silicon rectifiers on the positive side of the bridge with a pair of 6CA4 valve rectifiers to ensure a gradual risetime at switch-on. I am aware that in the guitar amp community there is a consensus that using a valve rectifier gives a "softer" or "rounder" sound than solid-state rectifiers, mainly because of the increased source impedance of the PSU in this case, but I suspect that in the RTP3 the shunt regulator should effectively isolate the signal circuitry from the PSU. The current draw of each channel of the RTP3 is about 60mA, of which the phono stage draws 19mA, the line input stage 12mA and the line output stage 29mA. I set the shunt current in the HPHV to 10mA (17% of the load), so the total HT current suppled by the PSU is 70mA. This is as much as I would comfortably take from a 100mA rated transformer (and a 100mA rated choke): the transformers indeed got quite warm after an hour, though this is partly because of the crowding in the PSU box. The transformers supplying the valve heaters got warm too, even though they are working well within specification. I couldn't get hold of the terminal blocks used in the photos of Emile's RTP3C, which appear to be some kind of plastic (I assume PTFE) blocks, about 5mm thick, and have what looks like silver U-section contacts at about 5mm spacing. There are ten of these with nine connections, six with six and two with three. I made my own using 15mm-wide strips of 5mm thick PTFE sheet, and drilled a row of 1mm holes along the top of each these for component leads and hookup wire. They are attached to the chassis plate with 3mm bolts, two for each terminal strip. The internal wiring within the circuit modules is partly with 0.9mm solid-core 99.99% silver wire, and partly with 0.4mm single-strand silver-plated copper wire with PTFE insulation from Farnell: this looks very similar to the blue wire on Emile's RTP3. Instead of the silver ribbon used in the latter for ground and HV connections, I used bare silver wire, insulated where appropriate with 1mm bore PTFE sleeving. Allen constantly points out that the circuit topology is more important than specific parts selection (above a certain minimum quality, of course), and the bones of the RTP3 and the basic design conception make a lot of sense to me. For this reason I started off with standard good quality parts in most locations, as these should give a high level baseline performance. The standard grade of Maplin 50 ppm/oC metal film resistors are probably good enough for this preamp, and to start with I have used these almost throughout - Emile seems to have used very similar resistors in his, though they could be the more expensive Roederstein MK-2s. I used the small 0.6W rated ones in most places, with 2W parts wherever the voltage exceeded 200V or so. Allen gets the 25K cathode resistors, which Allen specifies as non-inductive wirewounds, made to order by Mills (I can't guess why he doesn't use a nice E12 value like 22K! ): I used four 100K 2W metal films in parallel in each of these positions. I swapped the 150R and 4K22 resistors in the RIAA equalisation network to Welwyn 0.1% precision parts after a while, though I can't say I heard any real difference in the sound. I started off using generic EPCOS metallised polypropylenes for the coupling capacitors, but after a couple of years upgraded them to Mundorf KP-SN tinfoil and polypropylene film (Allen's default type for his kits), and was pleasantly surprised by the improvement. I am generally sceptical when it comes to perceived changes in sound from passive components, but I did hear more midrange "texture" in instruments. The CD recording of Debussy's piano Preludes, arranged for orchestra by Colin Matthews and played by the Halle Orchestra under Mark Elder, has always sounded a little recessed and indistinct in my system, but with the Mundorfs in place I could hear a lot more of what was going on. Why I should hear an upgrade in a high-end preamp, though, when I am listening to a middle-range 1980s CD player, baffles me. The larger capacitors in the RIAA network are 0.5% polystyrenes, which I found in a Maplin "lucky bag": these are grey square parts, which I've never seen elsewhere, and are marked "TGL" and "KS". I can't find any reference to this range on the Web (though Thorsten Loesch assured me that they are from the former East Germany), but the narrow tolerance does at least imply good quality, and they certainly look more businesslike than the standard aluminium foil Styroflex types. I managed to get close to the "3.18us" value with a 23n7 in parallel with a 1n0 axial polystyrene, while the other was made up with 40n2 and 34n4, again with an axial 390pF polystyrene to trim it to the required 75nF. The TGL parts are only rated to 25VDC, so I'm crossing my fingers and hoping that the differential architecture of Allen's circuit will keep the DC offset between the anodes well below this. Most of the rest of the capacitors are 630V Epcos radial metallised polypropylenes: most of these are a higher voltage rating than is necessary, but this shouldn't be a problem (apart from the large size), and this usually means more linear operation. Allen has suggested to another RTP3 builder that the specified 2SK170bl JFETS, which are expensive and quite hard to find, can be replaced by the RF device BF245C. These have a large Idss, quoted in the datasheet as in the range 12-25 mA, which makes selection for the required currents (particularly in the output stage, with its standing current of about 12mA per leg) easier and more economical than with the 2SK170bl parts, which have an Idss of 6-12mA. I bought fifteen of them to start with from Maplin and found that they worked well in all the current sink circuits, with a variation of only about 5% in the current across the whole batch. The current sinks for the first two stages aren't shown in the published RTP3C circuit, but they are very similar to the JFET arrangement in the SLCF output stage. These current regulator circuits in fact strike me as quite clever, as they reduce the sensitivity of the current to the transistor parameters, compared with the simplest type of regulator where the current is strongly dependent on the Vp of the FET. All the same, I made up the source resistance of the JFETS in the phono stage current sinks (specified as 1K3 in the schematic for the 2SK170) with a 1K0 resistor in series with a 1K0 22-turn pot so I could adjust the constant-current circuits. I found that I needed about 1.5 kilohms, and the adjustment meant that I could set the current in the phono stage to within a percent or two. to give the required current, given that the Vp is larger in the BF245C than in the 2SK170bl. In the end I grouped the FETS into three groups of four, so the currents would be best matched in each of the three stages of the preamp. The valves are Electro Harmonix 6922s, supplied matched and balanced by Banzai; I chose this brand because EH seem to be one of the most often recommended current manufacturers on the Tube DIY Asylum, and are currently the ones supplied by VSE. The sockets are pretty basic ceramic items with nickel-plated (I think) contacts, but they do grip the valve pins very securely. My RTP3 originally used a simple op-amp based buffer circuit to provide a record output (which I used mainly to supply a signal for headphone listening). I found that there was a little bit of hum on this when I was listening to vinyl records, which I didn't hear through the speakers, so I took the opportunity to replace this circuit with a unity-gain instrumentation amplifier (right) to recombine the two differential signals and cancel the common-mode noise. This sounded fine (at least through the Akai cassette deck I use as a headphone amplifier) and all but eliminated the hum I heard through headphones with the old single-ended buffer. I hadn't appreciated, until I installed the valves into the phono stages for the first time and powered up, that the DC balance of the phono stage was so sensitive to the quiescent current. Of course, in retrospect this is obvious, as a 5% change in the current from the ideal 9.4mA leads to a change in anode voltage of 12V (in other words, an error of 18%), and on the low side this could easily starve the phono circuit of voltage. In the end I made the source resistors in the current sinks individually adjustable with 22-turn 1K preset pots in series with 1K resistors, the latter making it easy to monitor the current. The DC balance in the line section is less sensitive, but the biasing of the SLCF output stage does depend on the correct DC operation of the voltage amplifier stage, so I thought I ought to do my best to get it right. I found I had to raise the values of the source resistors in the current sink in the tail of the cascode by 20% to get close to 150V at the upper anodes,though I did expect to have to change them when I changed the FET type. A fellow RTP3 builder told me that Allen currently recommends that the grid bias on the upper valve of the line input stage be increased to 80V to increase the overload margin and avoid grid current, so I changed the voltage divider here to 82K/220K. Allen apparently also prefers 1K gate stoppers on the BF245C JFETs, since these devices (intended for RF application) are more prone to oscillate than the 2SK170 audio FETs. I don't know if this would be a problem with mine, but all the same I replaced all twelve of the 100 ohm resistors in this position with the higher values. The phono stage gain is the one aspect of the RTP3 that is determined by the parameters of the active devices: here the relevant parameter is the transconductance of the bipolar transistor pair. The RTP3D brochure quotes the gain in MC mode as 70dB (no frequency given, but I assume 1kHz), although this includes 20dB of line stage gain, so the net phono gain is 50dB. Measuring the phono stage gain of my RTP3 at 1kHz, I got about 450 (53dB), which suggests that the SSM2210 current gain is towards the upper end of the manufacturer's range. The two channels were matched to better than 1%. My comments here need to be qualified by the observation that my system is currently not up to the job of revealing the full qualities of my new RTP3. There is a slight dullness to the upper midrange, which robs the music of some if its sparkle, clarity and presence. I have narrowed this down to the active crossover (the "Full Monty" version), which I am now convinced is far too complex and clever for its own good, despite its flexibility: it is stuffed with op-amps, relays and cheap rotary switches, and I'm not happy with its gain structure either. The crossover also has some hum and a tendency to pick up Japanese radio stations, and I wouldn't rule out the possibility that there may also be a frequency response error. When I first set up my homebrew speakers a few years ago, with a different (simpler) active crossover, they sounded much clearer and crisper than they do now, so my next task after finishing the RTP3 is to sort the crossover out. Starting at the most functional level, there is no hum or buzzing from the preamp itself, although to start with there was a low level hiss from the tweeters which wasn't there with either of my other preamps. Allen told me that the RTP3 was optimised for sound quality, rather than for low noise, and thought that this kind of noise would be expected with a high sensitivity power amp like my Croft Series 5 and my 90dB/1W speakers. I modified my power amp to reduce the gain by 6dB, and this brought the noise to an acceptable level, and using the balanced input on the active crossover (another 3dB) further improved things. The phono stage is VERY quiet: even at maximum volume setting there is a TINY bit of hum, but I can't hear any change in the hiss from the tweeters. Despite my caveats above, there are aspects to the sound of my RTP3 that already clearly outclass by a large margin both the preamps I was using before it: the Croft Super Micro A valve MM-only preamp, and my own design solid-state line preamp, both partnered by the Audio Synthesis ADEQ solid-state phono stage. The attribute of the RTP3 which stands out most to me is its effortless presentation of real musical detail, which brings performances to life. There is a natural ease to music of any genre, which makes listening very easy and engrossing. On complex pieces, such as much of Bjork's extraordinary Medulla, every voice comes out distinctly with its own character intact. Another outstanding quality of the RTP3 is its dynamics. This was first obvious in its handling of percussion instruments: the Brazilian percussion ensemble which opens Paul Simon's Rhythm of the Saints has a palpable physicality and gives a mesmerisingly convincing illusion of having the drummers there in the room. The big drums sound huge, and there is none of the apparent compression I have heard with other preampliers. Another example is Benjamin Britten's Sinfonia da Requiem (Britten conducting the English Chamber Orchestra), where the percussion now has a real impact, and the Dies irae section becomes terrifying. Although the RTP3 doesn't throw detail in your face, it is very revealing. As an example of this, I have always known that my ancient Marantz CD60SE CD player needs to be switched on for a good twenty minutes before serious listening, otherwise it tends to sound a little thin and flat, and lacks bass weight and impact. Through the RTP3, this is more obvious than ever, and before I realised this I had almost been ready to throw away some of my CDs, assuming that the new preamp was simply too revealing of poor mastering and production. Once the CD player is warmed up, though, I was surprised how listenable good recordings sound. Although my turntable runs rings around it in terms of realism and texture, I can still hear far more of what is going on on my favourite CDs than I could through my previous preamps, without any extra fatigue (though I wonder whether the tonal balance of my system hides some of the failings of this old multibit player!). Roberta Flack is one of my favourite singers, and her soulful voice on her "Greatest Hits" CD became really seductive in songs like I Feel Like Making Love and Will You Still Love Me Tomorrow, in contrast to the previous relatively bland performance through the Croft. Similarly, Diana Krall's Live in Paris comes across as the excellent recording it is, with real energy and presence; the single studio recording on the album, Just the Way You Are, clearly lacks the live ambiance of the rest of the album. I listened to the RTP3 phono stage in comparison with the solid-state ADEQ phono stage, feeding the the latter through the RTP3's line stage. The source was my recently Vectored Pink Triangle turntable, with SME IV tonearm and Lyra Lydian Beta cartridge, and the input load on both phono stages was 1000 ohms. The two were very similar in tonal balance, which at least suggests that the RIAA equalisation in the RTP3 has no gross errors. I was very relieved to notice that the slight listening fatigue I felt with the ADEQ, which manifested almost subliminally as a tensing of my jaw after a side or so of listening, vanished with the RTP3 phono stage. This confirmed my hunch that it was the phono circuitry, rather than my turntable system, that was putting me off longer listening sessions. Listening to Debussy's Fetes (Concertgebouw/Haitink; one of my long-time favourite test recordings - partly because I love this piece, and partly because this is a terrific recording), the general impression of external detail was similar between the ADEQ and the RTP3. The trumpet fanfares were a little more forward through the ADEQ, which had a slighly more exciting presentation, while through the valve preamp the instruments had a "wholeness" and substance which seems more natural to me. The orchestra seemed to have a more holistic presence through the RTP3, especially in the rather Ravelian passage in the middle where the harp comes in quietly with an insistent rhythm which builds in the rest of the orchestra until the snare drums bring in the thrilling climax. During this section the harp seemed to hang in a more consistent acoustic background through the valve preamp. The RTP3 also seemed to have a wider dynamic range, so that the orchestral tutti swelled into the room, while the ADEQ was on the edge of straining in the louder passages. Listening to the simple arrangements on Tracy Chapman's self-titled first album through the two phono stages was fascinating - again, the differences were subtle. Chapman's voice is more distinct through the RTP3, and is more tangible and three-dimensional. The trenchant lyrics on this album are also more intelligible: the lines "Little black girl gets assaulted / Aint no reason why" at last make sense - I had always heard this as "Little black girl gets a sausage...". I had previously assumed that the slight crunchiness on the high-pitched percussion were artifacts of the digital mastering, but through the RTP3 the cymbals and dulcimer on Across the Lines had much more realistic character and less sizzle. On Donald Fagan's The Nightfly - another digital recording - the cymbals, slightly sibilant and hard through the ADEQ, were again better resolved through the RTP3, and this album was generally more listenable. I was surprised to find that the valve preamp seems to be more transparent and controlled in the bass than the solid-state one: the difference in the bass guitar sound between the Tracy Chapman album, where it is fat and enveloping, and the thumping, almost slapped, bass on Joan Armatrading's Me Myself I was much more obvious through the RTP3 than through the ADEQ. The solid-state ADEQ seemed to have less bass control, with a slight tendency to wallow that the RTP3 didn't have at all. This was also evident in the Debussy recording, where the double basses sounded more distinct from the orchestra, rather than coming across as a background drone. I certainly hear no trace of what Brad Morrical calls "thin-sounding" orchestral strings in his Positive Feedback review of the RTP3D. Tchaikovsky's Serenade for Strings (South German Radio Orchestra) on LP sounds very lush and "bloomy" through the RTP3 in my system, even though this is a digital recording - as does the analogue Karajan/Berlin Philharmonic Berg Lyric Suite. One thing I have noticed with longer listening is that the RTP3 definitely needs to be on for an hour or so to sound good. For the first half hour or so the bass sounds weak and the midrange is quite muddled. Allen says he leaves his own RTP3 on all the time, and told me that it need to be on for twenty-four hours before it sounds its best - I have experimented with leaving it on for a day, and it does indeed seem to have an improved ease and clarity. The RTP3, however, consumes fifty watts or so, so I don't feel I can justify leaving mine on continually at the moment, given that I tend to do most of my listening last thing at night. My compromise is to switch it on when I get home from work so it's nice and warm for when I start listening to music a couple of hours later. I have no idea what might be changing during the warm-up time that should give such an obvious apparent change in frequency response! About a year after I finished the RTP3, I carried out a very interesting comparison with the legendary Audio Research SP-11: the RTP3 came out the superior preamplifier by a surprising margin, with better tonal resolution and more natural dynamics. I heard with great sadness that Allen has recently died from a malignant melanoma. This was a shock to me, as from all acounts he lived a healthy and active life, and he looked very well in all the photos of him I've seen recently, but these things happen to the best of people. I regret never having met Allen in person, as I would have loved to have the chance to chat to him. My condolences to his friends and family, and many posthumous thanks to his memory. After several years of wondering how much the solid-state active crossover and MOSFET power amplifier were holding my system back, I finally got a satisfactory passive crossover together for my homebrew speakers, so that I could mothball the op-amp circuits for good. I was very pleased with the result! Once I had sorted out the balance of driver levels and properly equalised the driver impedances, I was rewarded by a very listenable and relaxing, but colourful and dynamic, sound, which was a huge improvement over almost subliminally unsatisfying experience of listening through the active crossover system. I think the differential RTP3 now makes a very successful match for my push-pull 300B amplifiers, which Kevin Kennedy designed with very similar priorities of differential circuitry, fully regulated power supplies and no loop negative feedback. Interestingly, when I switch the power amplifiers to unbalanced input mode (or, with the same effect, connect up my Croft Series 5 amps in the same way), there is an audible hum through the speakers. This suggests that there is some hum pickup inside the preamp, which is cancelled by the differential topology of the power amplifier. I will chase this up at a later time: since it isn't normally audible there is no hurry, but I would assume that the circuit must perform better when all sources of noise are minimised. Firstly, of course, I am very grateful to Allen Wright for the original inspiration and circuits, as well as for his generous and helpful advice. I have had many stimulating and productive e-mail exchanges with other RTP3 builders - especially with Arthur Cheng and Okan Karagoz. I would also acknowledge Sebastien for pointing out the error in the HPHV PCB. A thread on DiyAudio on the HPHV regulator. A (very long) thread on the same forum on building the RTPC. A discussion of current production 6922 valves on the Audio Asylum. Westward Plastics, who supplied the 305 x 305 mm piece of PTFE that I cut up to make the terminal blocks. BTB Electronics in Nurnberg, Germany, who have good prices and excellent service. I bought the EH 6CA4 rectifier valves from them. The offputtingly-named Banzai Musical Effects in Germany, who supplied the valves for this project. They stock a great range of valves and other good-quality parts at excellent prices (how do so many UK suppliers get away with the ridiculous prices they charge? Hooray for Internet shopping!). Variable Voltage Technology Ltd, providing a range of transformers and chokes. Foremost Electronics, a supplier of ELMA rotary switches in the UK. Metal Supermarkets in Southampton, where I bought the aluminium sheet for the enclosure - good for small quantities of sheet metal for the DIYer.